Enter your info to learn more or to request a live demo. Enter your info to build an account. Vehicle price guides have around since 1926, when the Kelley Car Company began to collect data from its small dealership to publish the first edition of what is now the widely known and respected Kelley Blue Book (KBB). KBB uses over 250 sources, primarily through data made available through its parent company, Cox Automotive, which owns organizations such as Manheim, Autotrader, VinSolution and NextGear. NADAguides pulls data from wholesale transactions through its relationship with NAAA and from retail transactions through data from its parent company, J.D. Power. NADAguides places more emphasis on mileage, vehicle features and geography. 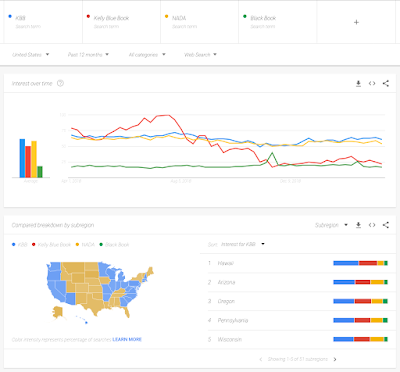 Black Book, the only of the three major guides to an industry - not consumer - tool, pulls data from 162 wholesale auctions, and uses VIN-based history adjusted valuation from AutoCheck reports. Black Book places more emphasis in mile, vehicle history and year. Which Vehicle Price Guide Should You Use? The quick review above makes it very clear why there is often confusion in the marketplace. The three most prominent pricing guides use different criteria and different data sources to arrive at a value. This often leads dealers asking the question "Which one should I use?" The short answer is all three of them... with the caveat that none of them should be the primary pricing source for your dealership with new technological tools at your disposal. For dealerships, choosing the right pricing book really comes down to three factors. 1. Vehicle appraisals - Many dealers use all or a combination of these books as a starting point for vehicle appraisals. But it should be noted that book values do not reflect the true market pricing in real-time and dealers relying solely on book value might be making less accurate appraisals and leaving extra gross on the table. 2. Financial institution requirements - KBB, NADA and BlackBook are so well-trusted that banks, credit unions, and other financial institutions require their valuations for car loans. Lenders will use vehicle valuations to calculate loan size and interest rate. As a general rule of thumb: Financial institutions in the Midwest and on the East Coast require NADA prices. 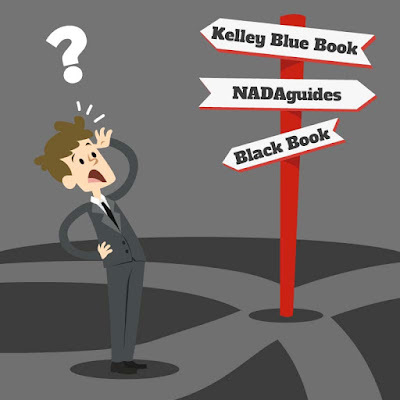 West Coast institutions usually rely on valuations from Kelley Blue Book, while those in Southeast primarily use BlackBook. Dealers should check with their local banks and credit unions and make sure they are using the right pricing book. Search term interest over the past 12 months. 3. Customer preference - Customer preference another major factor. Today's car buyers are knowledgeable and have no shortage of information at their fingertips from one of these sources. If you aren't well-versed in their preferred source, you risk alienating customers and could jeopardize a deal. Combined with various online listings, customers can reliably gauge the price range of any particular vehicle. Once again the valuations your dealership uses with consumer interactions will generally depend on your location. For East Coast and Midwest dealerships, NADAguides are the way to go. West Coast dealerships should rely on KBB. However, no matter what part of the country you are in, you should still be knowledgeable on all three. For several decades, vehicle price guides were the only reliable source to dealers and consumers looking to arrive at value. While they show no signs of going away, an explosion of technology has enabled pricing and appraisal tools that aggregate data in real time based on their local markets. 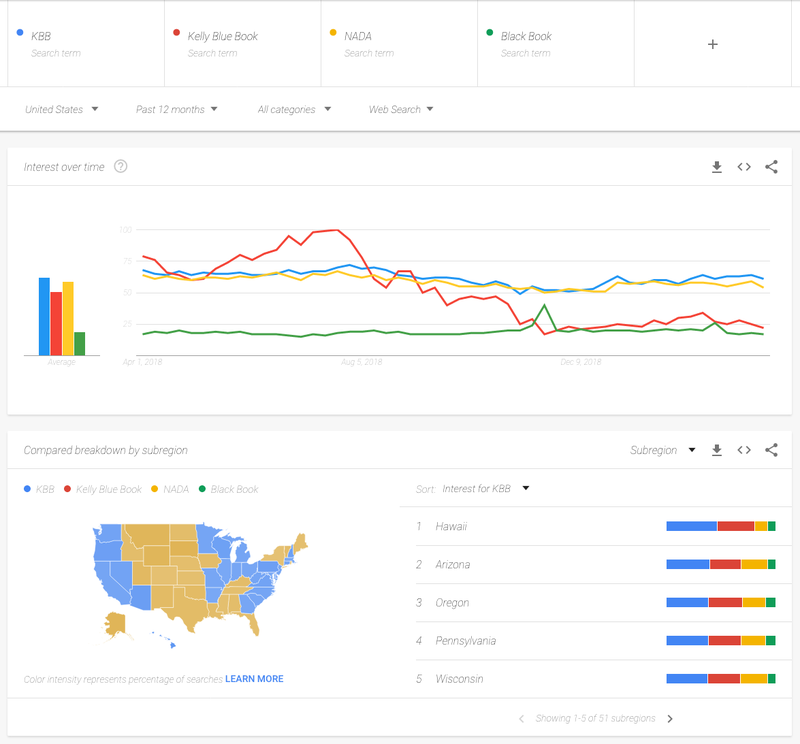 These tools provide a much more accurate method of appraising a car... baed on your region, the current market conditions and a host of other factors. Dealerslink members are already benefitting from this thanks to our Live Market Pricing tool and our FastBook Vin Scanner. - Access the most comprehensive live retail-market data for competitive pricing. - Instantly retrieve NADA, KBB, BB, MMR valuations, CARFAX and AutoCheck reports and DealersLink Comps. - Calculate a simple vehicle grade based on consumer interest, market velocity and market supply. - Book-out NADA, KBB, MMR, Black Book, Competition View and DealersLink Comps simultaneously. For more information or a free demonstration call 844-777-7872. We stand as a part of the dealer community, never apart from it. DealersLink, Inc. is a state-of-the-art industry leading authority on automotive systems integration and networking technology. Founded in the late '90s by a team ofauto dealers, DealersLink established the first dealer-to-dealer marketplace in the United States. In fact, we coined the term "dealer-to-dealer".